Charles Kurzman, “When Republicans Needed Muslim Allies,” March 31, 2016. One week after 9/11, President George W. Bush visited a mosque two miles from the White House and delivered a speech on Islam that today’s Republicans could learn from, especially in the wake of the terrorist attack in Brussels. 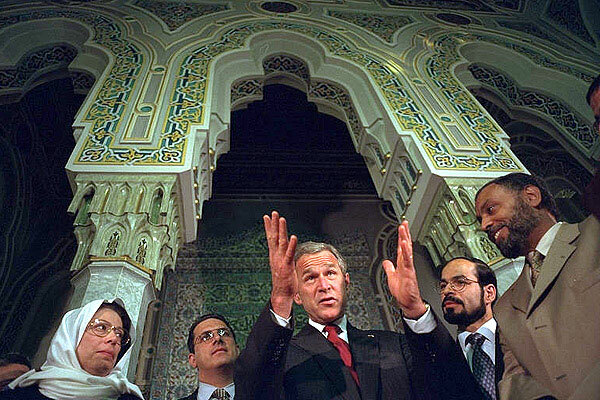 Unlike today’s Republican leaders, President Bush recognized that preventing Islamic terrorism required Muslim allies, and his appearance at the Islamic Center of Washington, alongside Muslim-American leaders, focused on this alliance. “Like the good folks standing with me, the American people were appalled and outraged at last Tuesday’s attacks. And so were Muslims all across the world,” Bush said. “The face of terror is not the true faith of Islam. That’s not what Islam is all about. Islam is peace,” Bush continued. As a born-again Christian, Bush was hardly qualified to interpret the meaning of Islam. But as a public official who considered Islamic terrorism his number-one priority, Bush could not risk the war on terrorism being viewed as a war on Islam. In particular, Bush was concerned that vigilante attacks on Muslim-Americans would undermine his administration’s efforts to mobilize the world’s Muslims against al-Qaeda and other revolutionary groups. Such attacks were illegal and immoral, as well as counterproductive. Bush’s speech saved lives. In the first days after 9/11, two men were killed for looking like Muslims – a Sikh man in Arizona and an Arab Christian in California. The number of hate crimes against Muslim-Americans spiked into the hundreds, according to FBI statistics, and would surely have risen higher if Bush had not denounced intolerance so strongly. It is hard to imagine Republican leaders making such an appeal today. Instead, we see the opposite – hostile and inaccurate generalizations about Islam and Muslims that encourage bigotry and recklessly cast suspicion on the vast majority of Muslims who have no connection to terrorism. Sen. Ted Cruz responded to the Brussels attacks with a call to “patrol and secure Muslim neighborhoods before they become radicalized,” treating all Muslims as potential terrorists. The Republican candidates’ views toward Muslim-Americans reflect a growing strain of intolerance over the past decade. In the first years after 9/11, surveys found more Americans reporting favorable views of Muslims than unfavorable views. Beginning in 2010, I have found, the negatives began to rise, from an average of 30 percent to an average of 45 percent. Another survey found that 36 percent of Republican respondents felt that Islam should be illegal in the United States. An additional 25 percent said they weren’t sure. (Among Democrats, 15 percent said Islam should be illegal, and 18 percent weren’t sure.) Outlawing Islam would run counter to America’s commitment to the freedom of religion. It would also complicate counterterrorism efforts, to say the least. President Bush, by contrast, invited Muslim leaders to celebrate Islamic holidays at the White House, just as he invited Christian and Jewish leaders for religious holidays. It may strike liberals as odd to think of the Bush administration as supportive of Muslim-American rights, since it launched massive programs targeting Muslims in the United States. In the effort to prevent more 9/11’s, the Bush administration established the Department of Homeland Security with a mandate to fight Islamic terrorism, directed the National Security Agency to spy on Americans’ electronic communications, and diverted thousands of federal agents to scour the country for Muslim-American terrorists. The Obama administration, like the Bush administration, continues to place Muslim-Americans under heightened suspicion. But ever since President Bush’s mosque speech in September 2001, public officials have generally been careful not to demonize the community whose assistance they seek. In some Republican circles, that appears to have changed.